The Michaelis School of Fine Art, the namesake of the Fine Art Department of the University of Cape Town, is located on Hiddingh Campus, which is a cluster of university buildings between Orange Street and the Company’s Gardens, Cape Town. Named after the Randlord Sir Maximillian Michaelis (b. Eisfeld, Germany 11 May 1852, d. Zurich, Switzerland, 26 January 1932), who founded a diamond company in Kimberley that was later acquired by De Beers, the school was opened in 1925 after Sir Michaelis’ endowment of the chair of Fine Art in 1920. In addition to his patronage of the oldest Fine Art Department in South Africa, Sir Max Michaelis also donated the Michaelis Collection of 16th – 18th century Dutch and Flemish art (bought from Sir Hugh Lane in 1912) to the Union of South Africa, which is housed in the Old Town House on Greenmarket Square, the first art museum in Cape Town. Hiddingh Campus is the historical location of the South African College, which would by 1918 officially be designated the University of Cape Town. Within its nexus is the Egyptian Building, built in 1839 as South Africa’s oldest structure used in tertiary education, and declared a National Monument. Hiddingh Campus also includes the Michaelis Galleries, an exhibition space affiliated with the university showing the work of students, alumni, and non-affiliated artists in temporary exhibitions, as well as the Department of Drama, the Little Theatre, Arena Theatre, Hiddingh Hall Library and the Iziko Bertram House Museum. Michaelis offers medium specific undergraduate and postgraduate courses in Painting, Sculpture, Print-media, Photography and New Media. Since 2013, in partnership with Iziko Museums, the School includes a dedicated Honours programme in curating, which seeks to develop curatorial practice and museology in South Africa. Other sections of Michaelis include The Centre for Curating the Archive based in the Old Medical Building, which seeks to strike a balance between conservation of historical materials and making them publicly accessible, and the Katrine Harries Print Cabinet. Associated with Michaelis is The Institute of Creative Arts, run by Jay Pather, formerly known as the Gordon Institute for Performing and Creative Arts, which, since 2016, offers postgraduate courses in Live Art, Interdisciplinary Art and Public Spheres. Current staff of the Michaelis include the Director Berni Searle, Professor Jane Alexander and Senior Lecturer Nomusa Makhubu, with Penny Siopis as Honorary Professor. 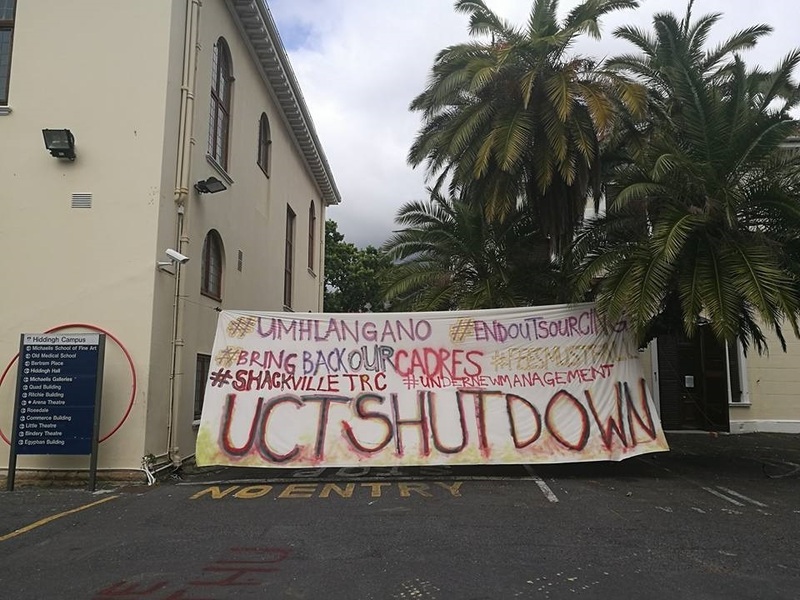 Hiddingh Campus and Michaelis was occupied by current students in the second wave of FeesMustFall protests from 23 September – November 2016, under the name Umhlangano, a Black Student Movement against racism, queerphobia, transphobia and ableism and towards safe spaces. The students addressed how far Michaelis still has to go in the process of inclusivity and decolonisation through art works, performances and interventions, strategies of protests and disruptions specific to the campus shutdown. Notable alumni of Michaelis include Handspring puppeteers Basil Jones and Adrian Kohler, Marlene Dumas, Sue Williamson, Barend de Wet, Jo Ractliffe, Randolph Hartzenberg, Muthoni Kimani, Lien Botha, Angela Ferreira, Thembinkosi Goniwe, Mikhael Subotzky, Hasan and Husain Essop, Nandipha Mtambo, Mohau Modisakeng, and most recently, the collective iQhiya. Besides its academic and research facilities, UCT is well known for its contribution to the development of Arts and Culture in Cape Town and South Africa. Central to this is the University’s Baxter Theatre – built in 1977 and open to all even in Apartheid years. Today UCT Art’s faculties comprise the Baxter Theater, the School of Dance, the Gordon Institute for Performing and Creative Arts (GIPCA), the Irma Stern Museum, The Kirby Collection, the Little Theatre, the Michaelis School of Fine Art and the SA College of Music.